850 km. That is what I covered since leaving yesterday morning at 6 am. After a shoot in Gifu I headed straight down to Nagoya, ready to cover the Exciting Car Showdown that is being held this week-end at the Porte Messe exhibition center. 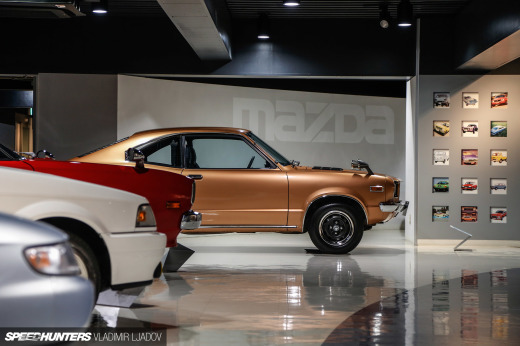 This event is all about getting some of the best tuned cars from around Japan together, and as you can see from these teaser shots the assortment on display was simply incredible. 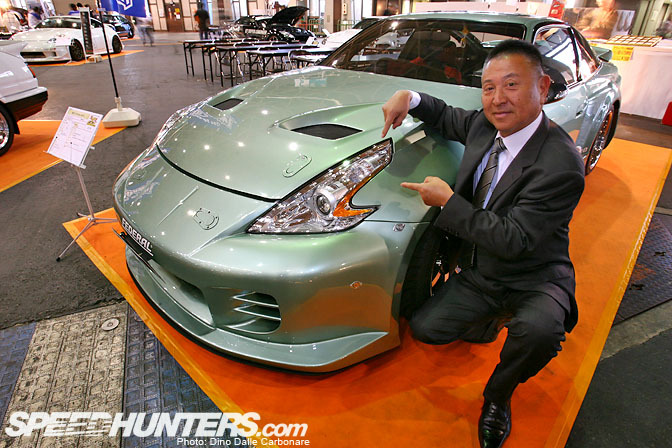 Here is Daijiro Inada, the man who in the last 2 decades has promoted and built the JDM tuning world to the level it sits at now. 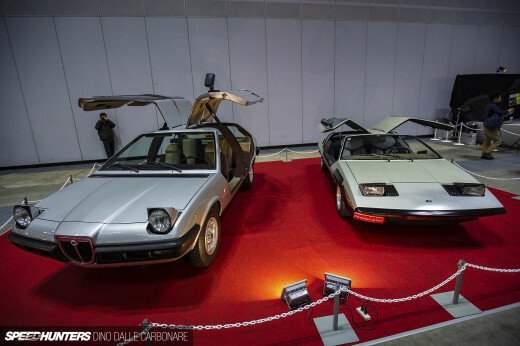 The show is his idea, and only by invitation, so if Dai-can doesn't like your car there isn't much you can do! In the picture above he is proudly showing off the Z34 headlight conversion that has just been done by Top Secret on his D's Club RPS13. 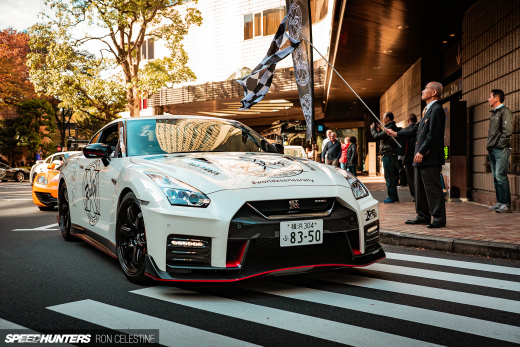 This HCR32 from the guys at RYO in Hiroshima is one that caught my attention straight away. 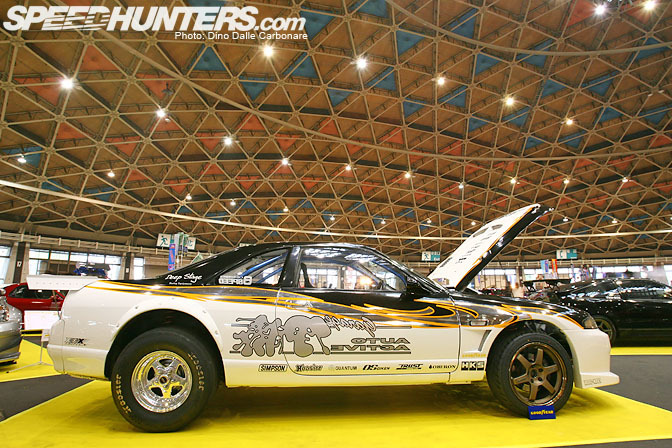 Pumped to hell this "Champ Road Skyline," as they call it, might as well be a take on a a more futuristic approach to the whole bosozoku style. You gotta love those fenders and there is an RB26 lurking under the hood so it probably goes (or drifts) as well as it looks. As I was happily shooting away on the RYO Skyline Dai came over and told me to follow him. He said he had to show me a pretty crazy ride, one he had to make sure I got some shots of. The car in question is the "Odyvia", an S13 Silvia sporting a pair of JDM Honda Odyssey headlights. Custom bodywork all round and an impossibly glossy deep candy red made this one of my favorite cars of the show. Look at the orange paint job on this Final Motion BNR32, and yes that is a billet center wing stay. 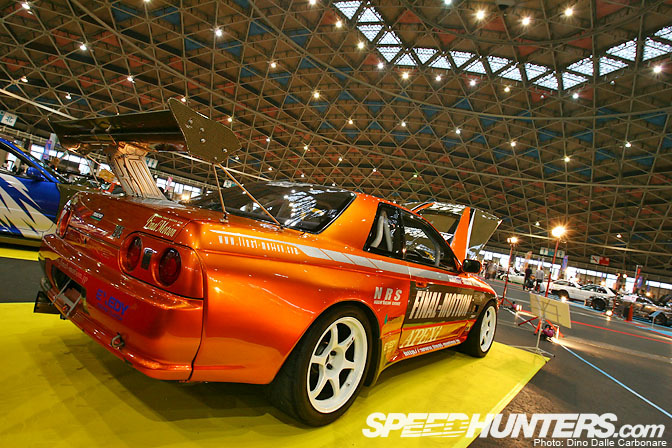 This RH Factory KGC10 Skyline had one crazy stance. 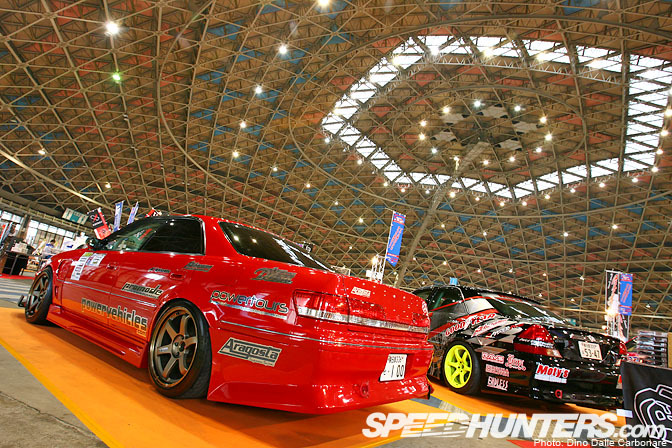 Check out those massive Panasport G8s, even the overfenders can't hold them in! And who said drag racing is dead in Japan? This is Garage Ito's work-in-progress BCNR33 looking pretty sick. This slammed Chaser was my favorite JZX100 at the show. Andy from Powervehicles.com brought down his freshly re-sprayed Corona MKII, which was sitting next to Kazama Auto's 2009 JZX110 wrapped in totally new graphics. 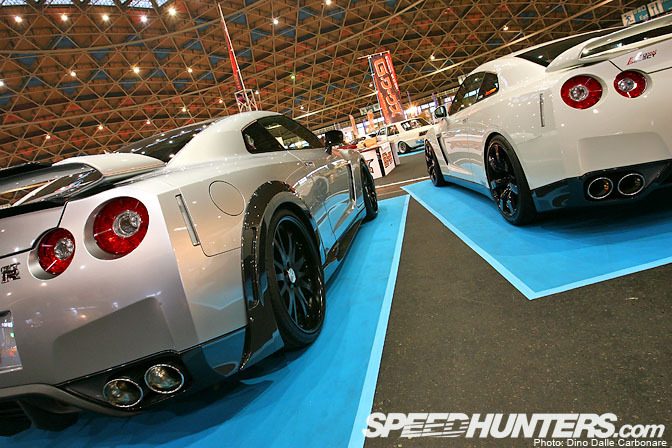 And for a final shot a couple of tuned R35's, the WALD on the left and the Auto Select on the right. Stay tuned for the full coverage from the Exciting Car Showdown tomorrow. Gorgeous KGC10 !!! Very close to what Rocky Auto would build. i want to come in Japan! I demand more pics of the oddysey-faced S13, looks so cool. i've seen civics with oddy headlights....but the s13 just look awsome! cant wait for the full coverage. Any more snaps of the Final Motion R32? 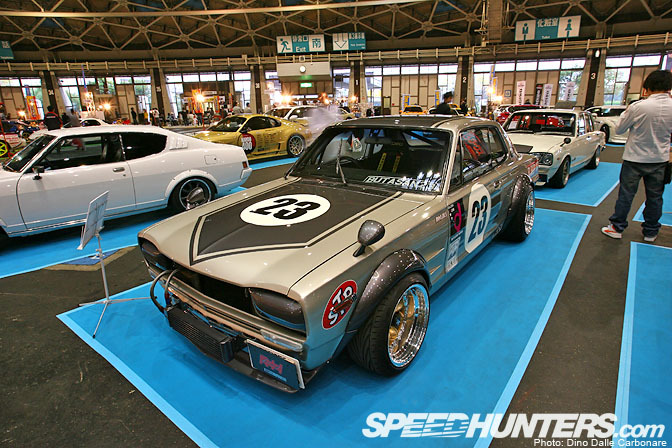 I'm guessing that Garage Ito skyline ain't an BNR33; the GTSt side markers are a tell-tale, no? Interesting that you correctly named the Mark2 as a Corona, which it is. You usually only them referred to as that on Japanese auction sites. Nice "Odyvia"! Luv those JZX most..especially that chaser..
it looks so new and concept-ish, might make it as a 1/10 scale RC drift car... the odyssee and the s13 are purchasable as bodies! odyvia is bangin! I can haz moar pics? as usual Japan is ontop of the world . 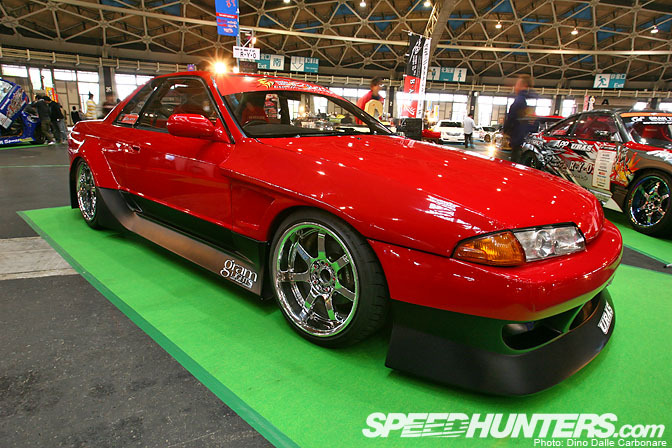 Hey good coverage, im really digging the slammed chaser and the KGC10 skyline. Is there any possibility of any more pics?? Mayb even a few wallpapers? ?